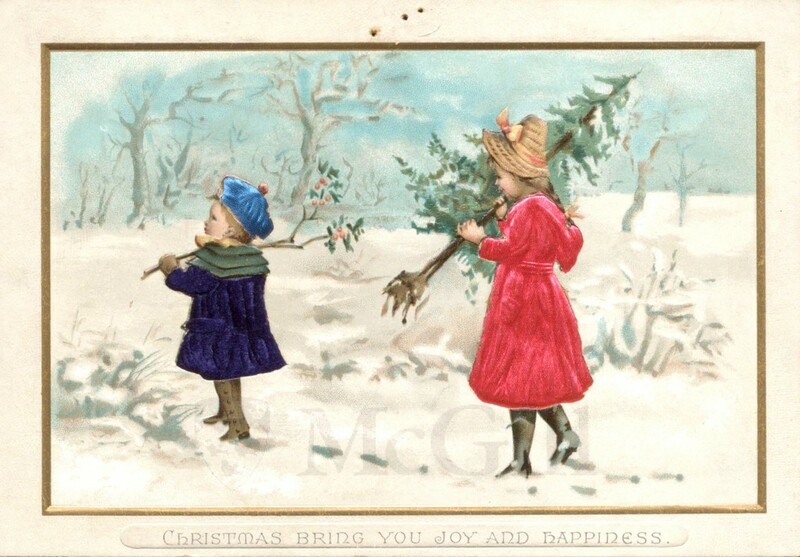 Rare Books and Special Collections holds a wide variety of Victorian holiday cards which form just part of a much larger greeting card collection, amounting to many hundreds of examples, designed for almost any season or occasion. 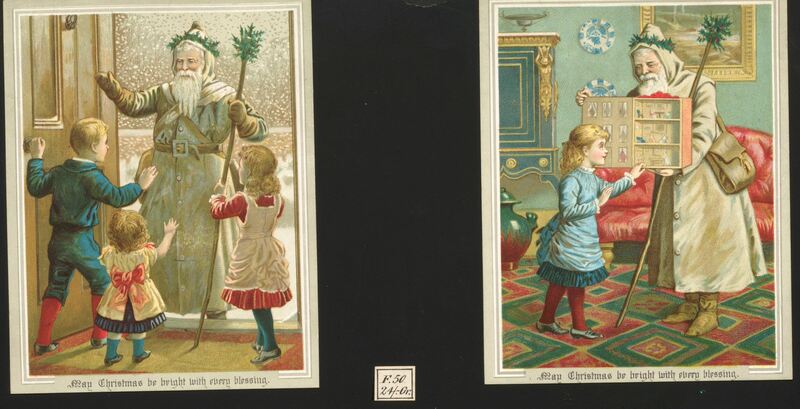 Christmas cards of Saint Nicholas, extracted from a specimen sheet of four cards for sale. Of special interest regarding the print trade are the specimen sheets used for commercial purposes, ticketed with the price per quantity on the sheet. They feature a range of options for choice of image or greeting. The collection also consists of pages from private scrapbooks revealing a kaleidoscope of styles from this era. The vast majority of our holiday cards have been collected or added as single specimens. Some are complete with manuscript greetings or personal notes, which hold interest for cultural historians. In each case, they are rare due to their ephemeral nature. 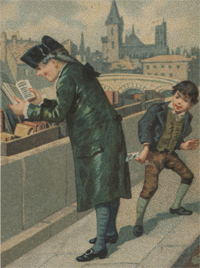 Most of the cards demonstrate the application of the technical revolution in the printing of illustrations in the nineteenth century. 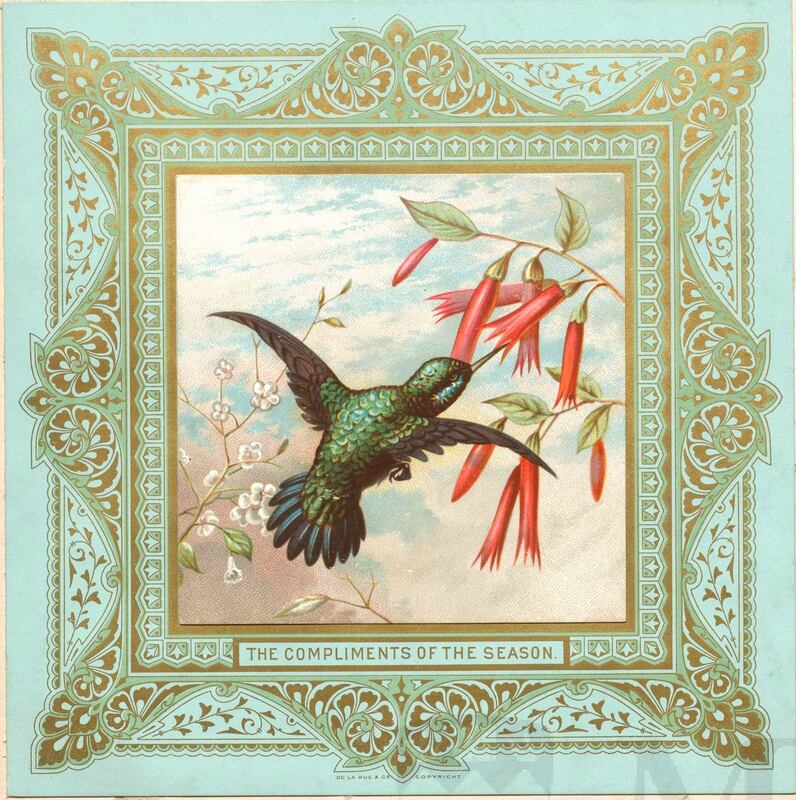 The designs are usually high in colour, printed by chromolithography, which was at the height of its popularity around 1860. We might see as well the use of photo-mechanical techniques, such as photogravures, mounted as inserts on card stock. Some cards were embossed for added effect and in some cases, fabrics were used to dress up the card. There are pop-up, single-sided cards with personal notes on the back, or cards that open with printed verse inside. Some of the latter might be stitched by side ties or decorated by ribbons, while some of the former might be fabulously framed by a fringe, and used as decorations with an attached piece of fine rope. A few of these extra-ordinary examples are currently on view in the main Reading Room of Rare Books and Special Collections, located on the 4th floor of the McLennan Library Building. Embossed Victorian Christmas card with velvet overlays. And best wishes for a wonderful holiday.